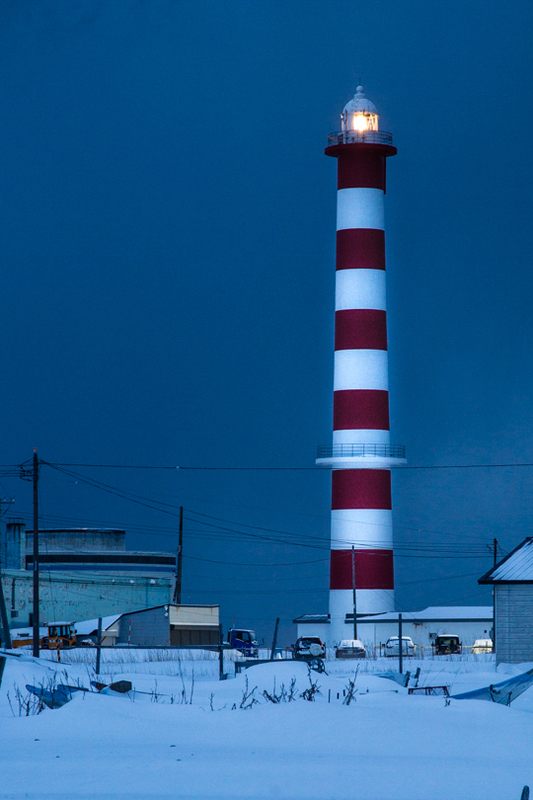 Wakkanai, Japan’s northernmost city, is only six miles across the channel from Russia. And it’s Russia, specifically Siberia, that influences it’s weather. It’s the cold north wind blowing in from Siberia that brings massive amounts of snow to this area. As we drove in, the blowing snow made visibility nearly zero as we approached the city on the national route 40. Our hotel here, the ANA Crowne Plaza, was unquestionably our nicest hotel of the trip. Yet, it wasn’t the most expensive. It seemed nearly empty when we arrived on Thursday afternoon but Friday night there were several tour buses parked out front and quite a few more cars in the parking lot. There were dog sled races near the city that weekend. Wakkanai isn’t at the top of the list of tourist locations in Japan. 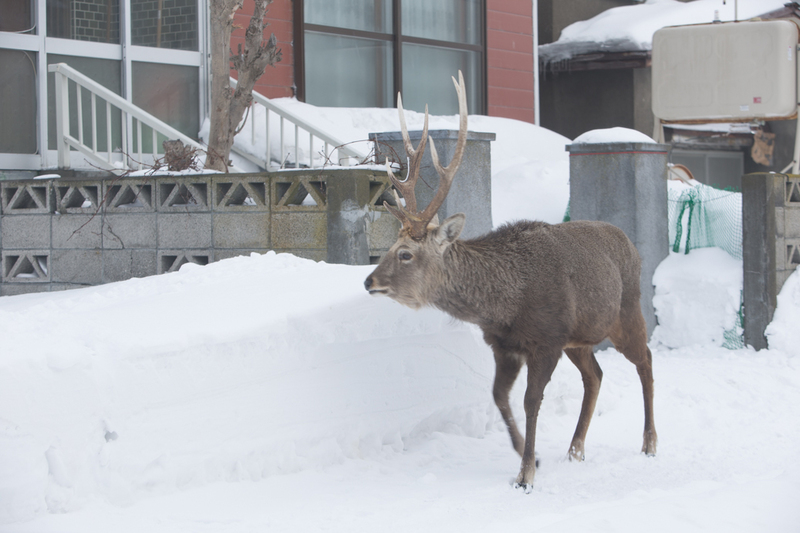 During our trip, David and I didn’t go near what is probably the best known city in Hokkaido, Sapporo. There may be ski resorts near that city but the only one we saw in Hokkaido wasn’t operating. We came to Wakkanai to photograph what is referred to as the “boat graveyard” and other coastal scenes. The boat graveyard is a group of nine small fishing boats that are decaying near the beach about an hour south of the city on the western shore. When we found them, they were nearly buried in snow. I’ve seen other images of this location taken in January and February and there wasn’t nearly as much snow as when we found them. As we worked our way around the boats, we occasionally sank up to two feet in snow drifts. We tried to go back to his location two days later and the coastal road was closed due to blowing snow and near zero visibility. We spotted this Axo deer wandering the streets not far from our hotel. The lighthouse at Cape Noshappu. 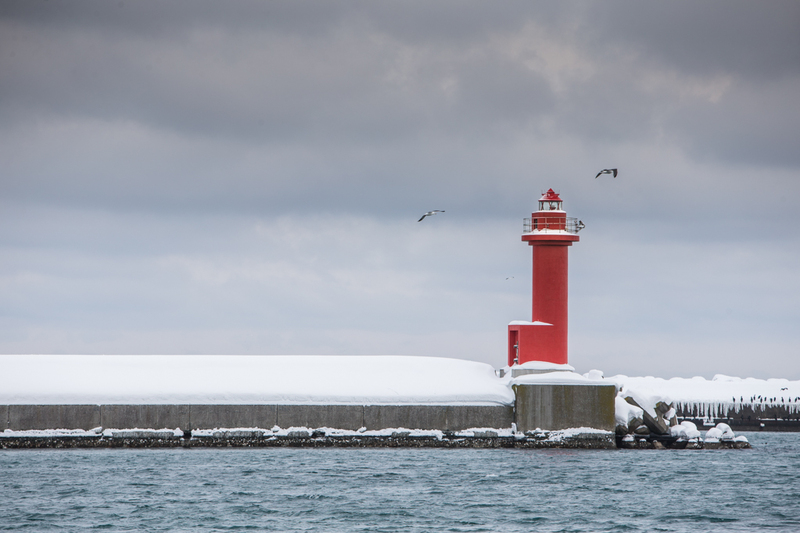 This is the lighthouse at the harbor at the very north end of Wakkanai about 5 minutes from your hotel. This image shows the underside of a breakwall visible from our hotel room. The outside, left side as you view this image, protects the shore from the pounding surf, the underside is used as a place for people to walk for exercise. I didn’t appreciate it much viewing it from my room but once you see it from underneath, it is quite artistic. 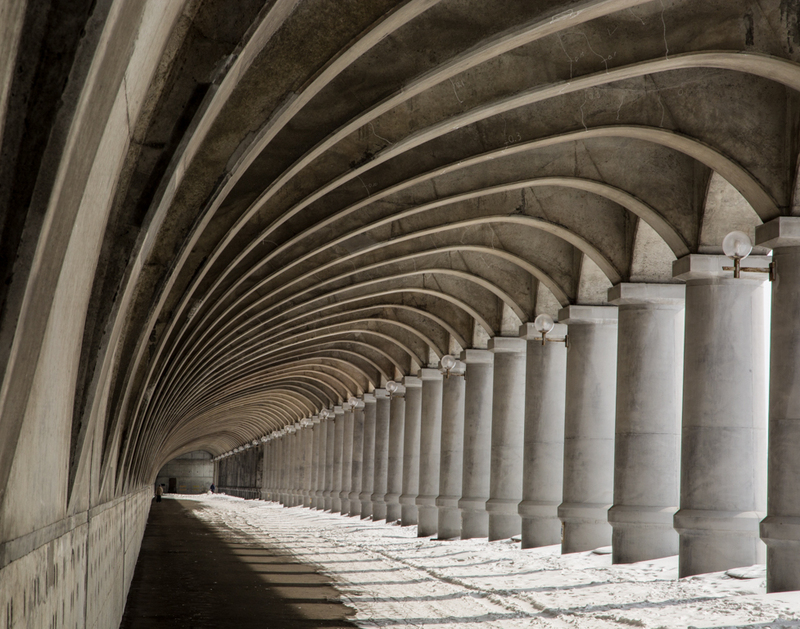 I loved the pillars and the design of the ceiling. This is one of my favorite images from the trip. David and I turned in our car at the Wakkanai airport on Monday, Feb. 26. We flew ANA Airlines back to Tokyo’s Haneda Airport where David had a connecting flight (after a six hour layover) back to Auckland. I had to do another night in Tokyo because I was unable to make the connection. I stayed at the same hotel about 15 minutes from the airport that we’d stayed at on our two previous stays in Tokyo. The next day I wandered around the neighborhood before taking the subway back to the airport for my flight to Minneapolis and then on to Kansas City. I left Tokyo Tuesday, Feb. 27 at 3:30pm (Tokyo time) and arrived in Kansas City on Tuesday, Feb. 27 at 4:30 (Kansas City time). Yes, that’s correct. It seems like I arrived in Kansas City an hour after leaving Tokyo but, unfortunately, that wasn’t the case. I gained a day due to crossing the International Date Line. I appreciate those of you who participated in my color versus black and white blog. There’s still time to offer an opinion. I’ll give you my two cents worth and have a few thoughts on different travel options in my final blog on Japan in the next installment.